If you are looking for a charming, friendly neighborhood, Chatham Colony Cluster in the Lake Anne area of Reston is a perfect fit. It is the kind of neighborhood where neighbors know each other and children wander freely in and out of each other homes. 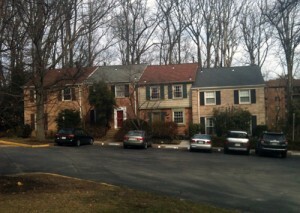 This is a small cluster of about 45 Colonial style townhomes. These townhomes have brick exteriors, shuttered windows, two designated parking spaces and wooded backyards. Like many Reston homes built in the 1970’s, each has beautiful hardwood floors and large windows. With three bedrooms and full basements, each home offers plenty of space for growing families and empty nesters alike. Perhaps one of the best features is that this neighborhood sits right off Moorings and North Shore Drive, just a five-minute walk to Lake Anne Village and a five minute drive to the Reston Metro station. Although not on Lake Anne, the Cluster does have a private dock for those with canoes, kayaks or small sail boats. The Cluster also offers easy access to the Reston Association pathway that circles Lake Anne, making walks around the picturesque lake easy. Children attend Forrest Edge Elementary, Langston Hughes Middle School, and South Lakes High School. The North Shore Pool is an easy walk across Lake Anne Plaza, and the sprinkler park is practically in the neighborhood’s backyard.